As long-time Lent Madness fans will know, the epic video series offered by Tim and Scott, Monday Madness, changes to Monthly Madness in the off-season. This is the first episode of Monthly Madness for 2016. 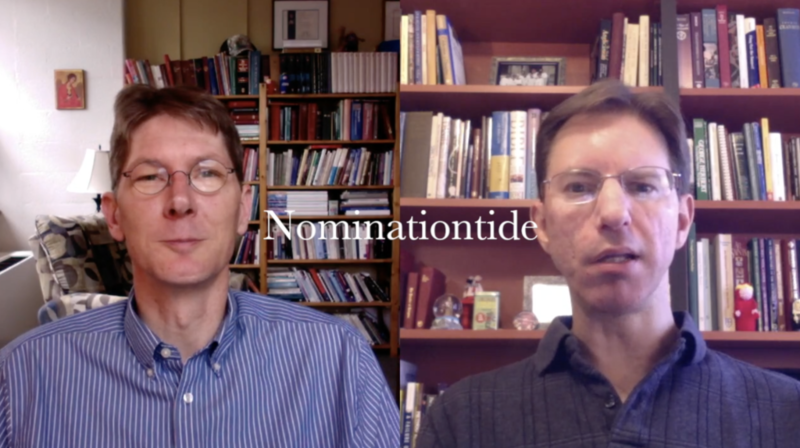 In this month’s episode, coming in the final hours of Nominationtide, the Supreme Executive Committee answers viewer questions about nominations. (Remember to make your nominations before Tuesday afternoon, April 26.) They also cover important topics such as the news that 2013 Elate Eight veteran Harriet Tubman will appear on the US $20 bill. There is only one place to make your nomination for Lent Madness 2017. Go to our Nominationtide post and leave a comment. That’s it. Well, that or a name penciled on the back of a $20 bill and mailed to the SEC. But the free version is to leave a comment on the Lent Madness post seeking nominations. 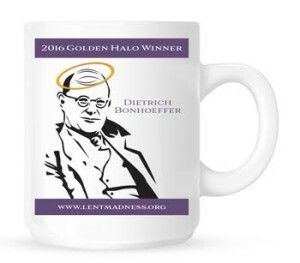 Make sure you stop by the Lentorium and stock up on Dietrich Bonhoeffer Golden Halo winner mugs or pint glasses, or Silver Halo winner Julian of Norwich soup mugs. At the moment, the items are being individually hand-crafted, so order now to make sure you’re at the top of the list when they ship. Or else you can camp outside Lent Madness HQ and buy them on opening day. It’s never a bad idea to binge-watch Monday Madness or Monthly Madness. This will help pass the time until it’s time for the next season. We always put this picture in to make social media shares more interesting. Never mind it. 13 Comments to "Monthly Madness — Nominationtide Edition"
Oooohhh, “hand-crafted,” is it now? Must have Pauli Murry. I’d add Micheal Curry (our Presiding Bishop), but I suspect the game uses only dead saints. As the widow of Bp. Bill Gordon, Third Bp. of AK, I second this nomination. Roland Allen was Bill’s inspiration for Total Ministry. I would like to nominate John Hus and John Amos Comenius. I nominate a re-issued Mary Mags mug. I am going to use every angle to make this happen. It seems so pointless to flesh out my collection with pint glasses and soup bowls when I can’t hold a complete set of the mugs. Let’s try a real Saint, how about one of the best, St. Augustine. Enough of these faux saints. Our newly sainted, Mother Theresa of Calcutta.